The news reports are saying all those bases in Iraq are ghost towns now. Just empty, dusty shells of places where thousands of American troops once lived, fought and died in the past nine years. In a few weeks, military operations in Iraq will officially be over. I was there for about a month in June 2007 to witness the “the surge,” as it was called. As you may already know from my previous posts about Iraq, my three-man news team was responsible for covering the Air Force’s contribution to that mission, which meant we hopped around Baghdad and the surrounding area. We traveled via helicopters mostly to various forward operating bases and paired up with weather and civil engineer folks, as well as some joint terminal air controllers who were calling in airstrikes to destroy the roads used to funnel weapons into Baghdad. There were just so many people. Soldiers in gray. Airmen in tan. Allies in their speckled uniforms. Third-country nationals pulling security detail or food service. Contractors in khakis. Humvees. Government trucks. Aircraft roaring into a combat landing. Helicopters whipping and humming in the night. But if you looked at my personal photos at the time, you wouldn’t know it. You would think I deployed to a ghost town there in the midst of one of the busiest, most violent summers there. Cement bunker on FOB Kalsu. Looking back, I’m struck by how few photos of people I took while in Iraq. My job was to write. For photos, all I had was my Canon Powershot, a point-and-shoot Martin bought me for my birthday a few months before. I wasn’t aware of all its features yet, so I think that played a part in me not using it as much as I did my video camera. I have a ton of video from Iraq, in which I captured so much banter between my team mates and activity at our locations. Broken office chairs in the tower at Baghdad International Airport. It wasn’t intentional, but I seemed to have gravitated to things that were broken there, and alone, which could very well be an indication as to how I felt there. While we went on assignments together, always checked in with each other, knew our general whereabouts and ate our meals together, I was more often alone than not. And to fight the boredom and anxiousness when not doing chores or writing letters, I took photos of those places, not realizing exactly what I was capturing, but appreciating it now almost five years later. For me, that place of much pain and suffering, even at the height of the war … it was always a ghost town. So full of loss and pain and stories we will never know. But we must never, ever forget. View from the Baghdad International Airport tower. Looking up the stairs at the (non-functioning) elevator shaft in “The Air Force House” on Camp Victory. Busted and broken. I’m sure it was once lovely. Just like Iraq. Pigeon outside my window on top of the Air Force House, looking out at Camp Victory. View from top of the Air Force House. The forward operating base where we were attacked. About 300 infantry soldiers were living on the other side of that wall, in the orchard. View from the hell seat in a Blackhawk, on the way to a forward operating base. One of the forward operating bases. Self-portrait minutes after returning to my hut after a mortar attack landed behind it, killing a female Army soldier and severely injuring about a dozen others. The moon. So far away. My bed at FOB Kalsu. Those sheets were what I brought. I used a bunched-up towel for my pillow. Slept with my hand on my M-9 near my head. I spent so much time alone in my hut. So I took photos. I wore everything I needed. If it couldn’t fit in the bag, I didn’t need it. 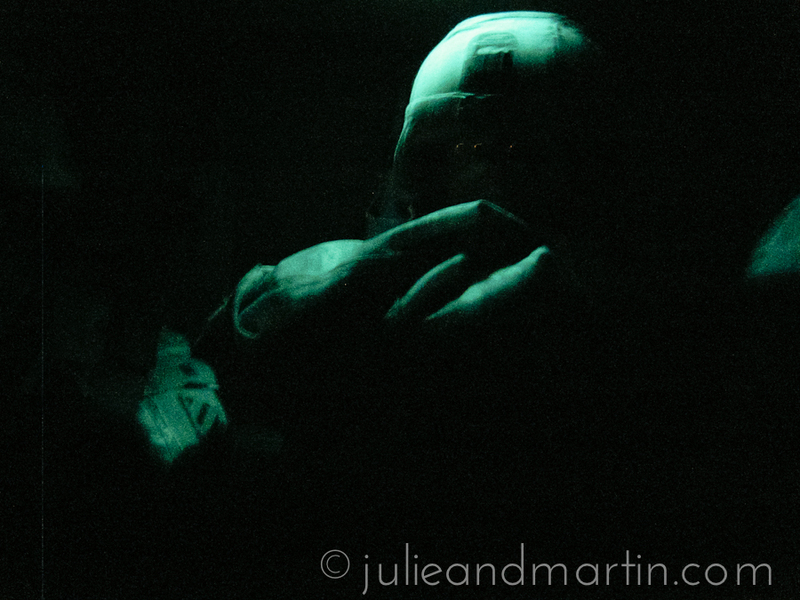 A soldier sitting across from me in a Blackhawk at night. That’s his helmet, reflection from his glasses and his duffel bag on his lap. All those signatures from all those people. Where are they today, and how are they doing? I will always wonder.